Americans support Donald Trump’s Jan. 25 comprehensive immigration reform by three to one, according to a new poll by Rasmussen Reports. Sixty-one percent of Americans agree with the immigration priorities described in Trump’s Jan. 25 Executive Order, which seeks to exclude migrants who oppose Americans’ values. Only 19 percent of Americans — and only 28 percent of Democrats — disapprove of Trump’s decision to align immigration policy with Americans’ civic and cultural values. Sixty-one percent approved the policy, 19 percent opposed, and 21 percent declined to answer the question. Fifty-one percent of African-Americans supported the policy, as did 49 percent of Democrats and 57 percent of independents. Trump’s popular policy was largely ignored by the establishment media, which instead focussed on his popular exclusion of Islamic migrants and refugees from several majority Muslim countries. That subordinate part of his plan is being opposed by pro-diversity Islamist groups, progressives, and judges in the Ninth Circuit of Appeals. Curiously, even though 28 percent of Democrats oppose Trump’s reform of immigration policy to match American values, 65 percent of Democrats also wish to impose tougher penalties on fellow Americans who commit crimes that violate progressives’ political values. When asked “Should criminals be prosecuted more severely if it can be proven that their crime was motivated by the victim’s race, color, religion, national origin or sexual orientation?” 65 percent of Democrats said yes, as did 57 percent of Republicans. The survey of 1,000 American adults was conducted on Feb. 20-21, 2017 by Rasmussen Reports. Other polls show that Americans want legal immigrants to integrate into the U.S. culture, and they oppose Americans’ integration into foreign cultures. 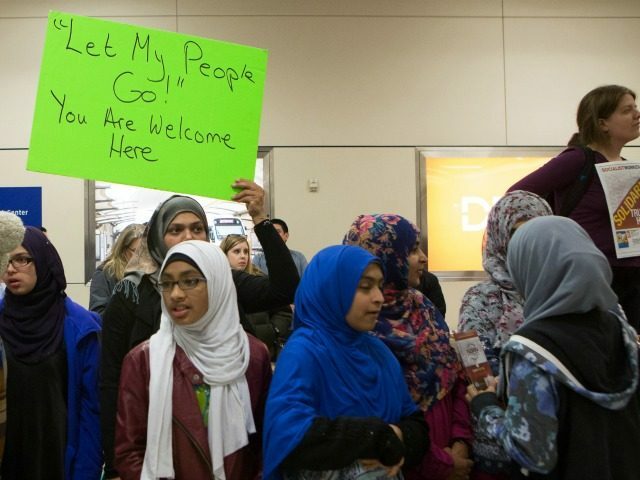 In June 2016, for example, a poll showed that 56 percent of Americans want to exclude migrants who believe in Islam’s sharia law, which requires that democracy and civic norms be subordinated to the Islamic scriptures. In contrast, only about 20 percent of Americans told the pollster that they did not oppose the immigration of people who believe in sharia law. Through his tenure, President Barack Obama boosted the progressive claim that Americans should not put their culture first but instead should subordinate their free-wheeling society into a diverse globalist mix of conflicting foreign cultures and governments. Sometimes we get attached to our particular tribe, our particular race, our particular religion, and then we start treating other folks differently. And that, sometimes, has been a bottleneck to how we think about immigration. If you look at the history of immigration in this country, each successive wave, there have been periods where the folks who were already here suddenly say, ‘Well, I don’t want those folks’ — even though the only people who have the right to say that are some Native Americans. When I hear folks talking as if somehow these [foreign] kids are different than my kids or less worthy in the eyes of God, that somehow that they are less worthy of our respect and consideration and care, I think that’s un-American. I don’t believe that, I think it is wrong and I think we should do better, because that’s how America was made. Alongside Americans’ support for their culture, Americans also want fellow Americans to get jobs and opportunities prior to foreigners. Polls show that roughly 80 percent of Americans say companies should hire young Americans before hiring migrants. A July 2016 poll shows that roughly three out of four voters — including nearly three out of four Democrat voters — believe that “instead of giving jobs and healthcare to millions of refugees from around the world, we should rebuild our inner cities and put Americans back to work.” The view was shared by almost 90 percent of African-Americans and almost 70 percent of Hispanics. Under current policy, the federal government annually provide new work permits to roughly 1 million legal immigrants and to roughly 1 million temporary contract workers. That policy adds roughly 2 million new workers to the labor supply each year, just as 4 million young Americans begin looking for work, and it shifts roughly $500 billion per year from employees to employers and investors, according to an analysis provided in a September report by the National Academy of Sciences.